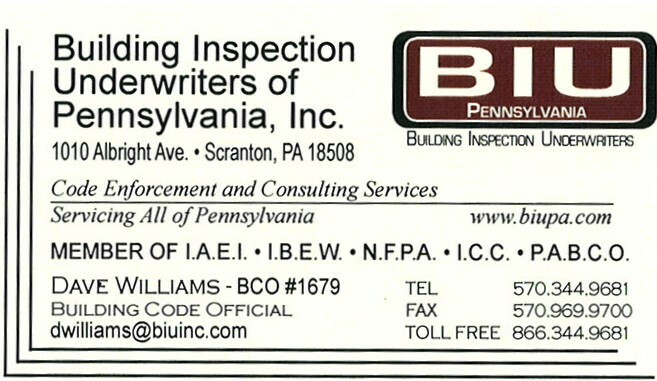 For new home construction and commercial construction Kidder Township is contracted with Building Inspection Underwriters of Pennsylvania, Inc. to provide services such as review of plans and other construction documents, inspect construction, plumbing and mechanical inspections. Please be advised that BIU will not commence work on building permits until Kidder Township has first issued a zoning permit authorizing such work and shall not take any action until all fees are paid and all required documents are properly submitted. Please note: These documents are meant to be printed and filled in by hand. Any attempt to complete using the computer will destroy the format and render the form useless. Please open, print and then complete by hand. Thank You. Meetings held the last Monday of every month when there are variances/special exceptions to be reviewed. There will be a Zoning Hearing Board Meeting on September 24, 2018 at 6:00 p.m.